In days gone by the popular Dorset seaside resort village of Lulworth Cove once had frequent regular bus services to Wool, Bovington, Wareham, Swanage and Weymouth operated by Southern National, and since 1952 a twice weekly Wednesday and Saturday market bus to Dorchester as well operated by Dorset Queen. Until the 1960s you might also have arrived in Lulworth in one of Cosen's paddle steamers from Weymouth, Swanage or Bournemouth. The Southern National bus services gradually disappeared during the 1970s. Interbus provided a partial replacement for a few years in the 1980s and whilst the Dorset Queen service to Dorchester continued two days a week the only other connections were a long standing Thursdays-only run (also by Dorset Queen) to Weymouth and a more recent post-deregulation 8-seater taxibus between Lulworth and Wool station provided by Garrison Cars of Wool, trading as the 'Little Red Bus'. 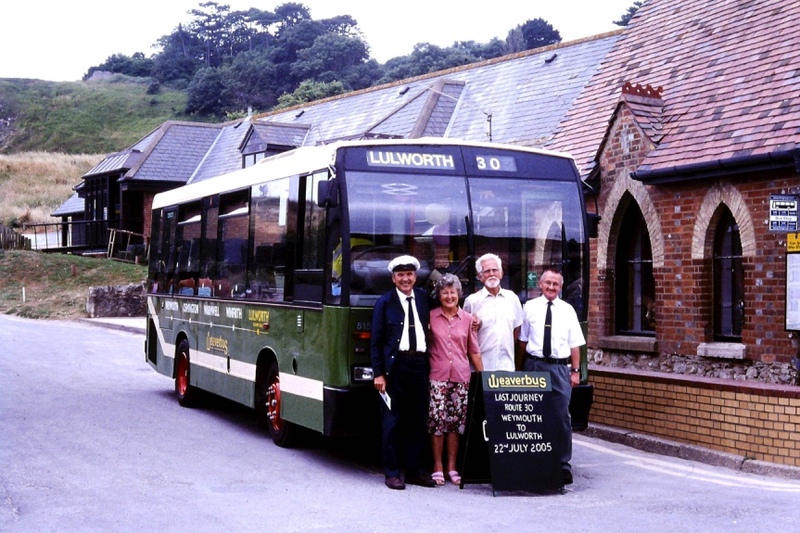 To improve the bus services to and from Lulworth a new initiative was started in June 1998, assisted by grant funding from the Rural Development Commission, Dorset County Council, National Trust and Lulworth Weld Estates. Called the Dorset Linkrider, two operators provided services to Lulworth where they met and interlinked and provided through connections. The two new operators were Swanage Taxis Limited running service 29 between Swanage, Wareham and Lulworth Cove; the other operator was Weaverbus running service 30 between Weymouth and Lulworth Cove. The route numbers were deliberately chosen as reincarnation of the long gone previous Southern National services. Similarly a common livery of dark green was used for the Swanage Taxi Renault and MCW and the Weaverbus Mercedes. Running Swanage Taxis from the eastern end of the route was Nick Hubbard, based at the railway station there, whilst Weaverbus was run by husband and wife team Rory and Joyce Weaver from the western end. The first summer of operation went well and in 1999 Dorset Linkrider was honoured by landing a place in the highly prestigious National Bus Industry Awards - dubbed ‘the Oscars of the Bus and Coach Industry’. 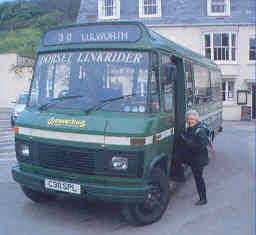 Dorset Linkrider was one of three services short-listed nationally in the ‘Bus in the Countryside - Visitors’ category of the 1999 awards, and were Highly Commended in the results. Also in 1999, with money from the Rural Bus Grant scheme, the county council revamped bus services in the area and new hourly services were supported through operator Dorset Transit from Dorchester to Wool and Bovington, with five a day running through Lulworth Cove. Dorset Linkrider continued to serve Lulworth from both Weymouth and Swanage and a "Packhorse" facility was proposed to enable walkers to send their backpacks ahead for later collection. 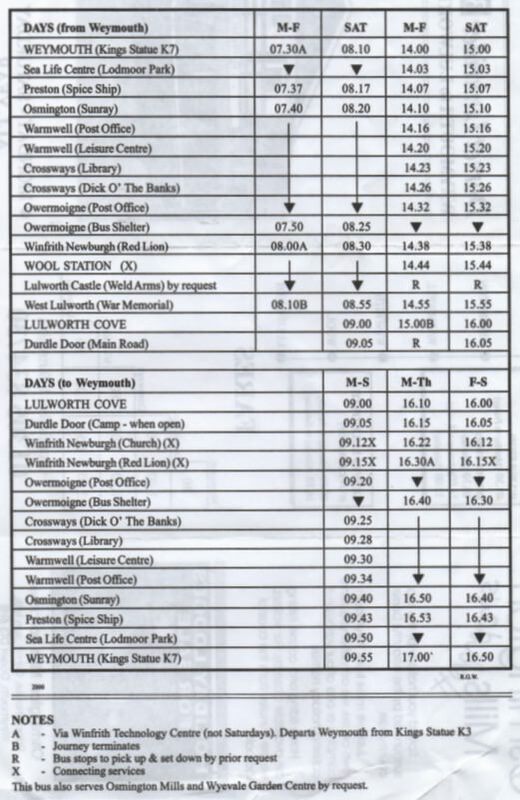 After the summer of 2000 the two halves of the Linkrider route tended to develop independently and the connections at Lulworth Cove (and the opportunity for passengers to travel through) decreased in number and frequency and finally ceased, as below. During the summer of 2002 (only) the 30 was extended to operate Weymouth to Wareham railway station. Swanage Taxis no longer operated to Lulworth at all but Weaverbus continued from the Weymouth end, with the timetable and service frequency adjusted seasonally. The “link” in Linkrider went after four and a half years on 8th September 2002. Operations on the 30 then included a morning and afternoon return facility between Weymouth and employment opportunities at Winfrith Technology Park as well as the established route to Lulworth Cove. Rory’s faithful Mercedes 608 twenty seater C311 SPL (new in 1986, ex-London Country) served the route for several years. An ex-Western National Bristol SU / ECW EDV 338 worked on the route from 1997 to 2000 (Rory Weaver had spent five years from 1992 renovating it and preparing it, including reseating it to 34 passengers). By 2001 the regular performer was Dennis Dart twenty-eight seater G515 VYE (new in 1990 to London Buses), which worked the route until closure. The Mercedes passed to Linco Travel of Henstridge, based just across the county boundary in Somerset. EDV 338 is now in preservation as Southern National 624 and has appeared at several rallies. As with many other rural services the Weaverbus timings were interworked with a school contract. This led to a route extension with positioning journeys to Puddletown from autumn 2002, with operation to Lulworth suspended until the summer of 2003. (The best carryings were in July and August during the holiday season and regrettably local traffic from the villages served had never developed to the extent anticipated). In March 2004 the feared loss of the school contract nearly led to the withdrawal of the stage route, as the financial interdependence was of importance to the continuation of the Lulworth route. Thankfully a school contract was regained and the stage service continued to operate through the summer of 2004 – but now joined at peak time in the school holidays by Sureline's X25 between Weymouth and Lulworth. Relations between the two operators were however very cordial. 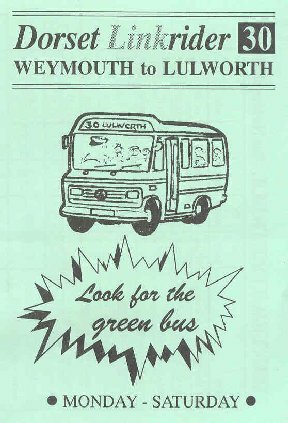 The Weaverbus service from Weymouth to Winfrith continued to operate during winter 2004/05, and in spring 2005 too - but still limited to Winfrith without serving Lulworth Cove. The end of the school term in July 2005 saw the end of the Weaverbus operation and routes, with the Dart sold to a collector in Surrey. Last day was Friday 22nd July. The need for the bus service had declined since the all year round X53 service was introduced by First Weymouth and the workers runs to and from Winfrith Technology Centre had been sandwiched by First's services X53 and 101 to104. Passenger carryings on the Weaverbus 30 in the peak month of August had fallen to a third between 2002 and 2004. But the autumn of 2005 saw the 101 to 104 group of services withdrawn at the end of October and replaced by a semi-flexible 'Door to Dorset' operation provided by community transport organisation NordCAT of Sturminster Newton. Nick Hubbard and Swanage Taxis still operated as Linkrider Coaches, including a Thursday market run to Wareham via Kimmeridge. From 25 July 2005 service Sureline route X30 provided the morning and afternoon workers services to and from Winfrith Technology Centre, and extended back from Weymouth to start from their Portland base. Along with the other Sureline routes operation passed to South West Coaches in October 2009. They continued the Weymouth - Winfrith service as their route 230 for a while. Summer 2010 saw a new X43 bus service (jointly operated by Wilts & Dorset and First) which linked Swanage and Weymouth via Lulworth Cove. During the six weeks of the school summer holiday period the bus ran four times daily including Sundays and Bank Holidays in each direction; so reviving the intent of the Linkrider of 1998. Similar arrangements have followed in subsequent years. To bring the story of buses in the area up to date, in the summer school holidays of 2016 First in Wessex operate their X55 from Weymouth to Lulworth and Bovington two or three times a day, seven days a week. Competitively More Bus (Wilts & Dorset) operate daily from Weymouth to Lulworth and on to Wareham and Swanage four times a day - reinstating the Linkrider route from end-to-end, and (perhaps sentimentally) numbered 30. Lastly there is the 104 operated by Dorset Community Transport twice a day on a six days a week basis (all year round) with two off-peak journeys from Lulworth, Wool and Bovington to Wareham and return. This will change to operation by Damory Coaches in October 2016. 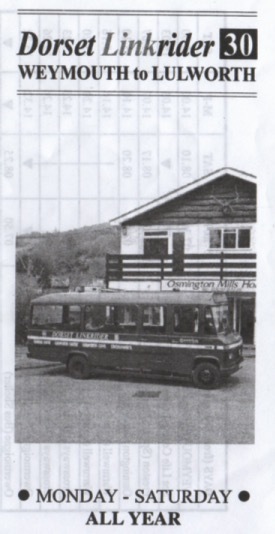 Above and right - a later Weaverbus timetable with route via Winfrith Technology Centre for workers and Crossways for shoppers, but before the diversion to Puddletown following the change of school contracts. The final day of Weaverbus operation after running since 1998 - Rory and Joyce Weaver stand in front of GYV585E at Lulworth Cove on 22nd July 2005, having reversed the bus ready to depart for Weymouth for the last time. Les Ronan, chairman of the Dorset Transport Circle, on right.